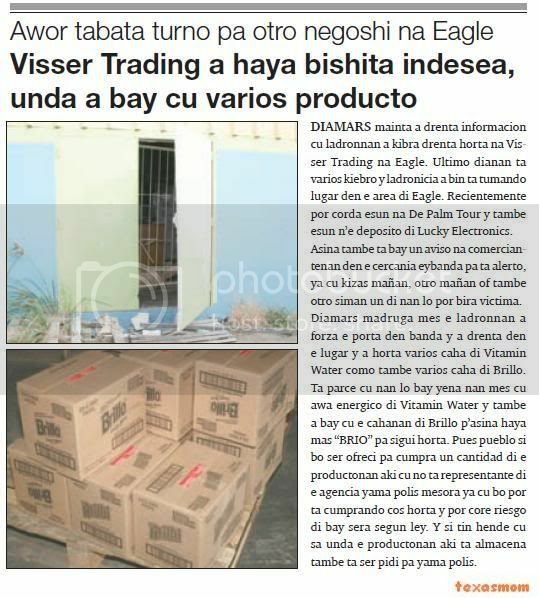 tuesday morning owing to enter informacion cu ladronnan owing to break enter steal at visser trading at eagle. ultimo dianan is several kiebro y ladronicia owing to come is tumando lugar in the area of eagle. recientemente can corda esun at de palm tour y also esun n’e deposito of lucky electronics. so also is bay one ad at comerciantenan in the cercania eybanda for is alerto, already cu kizas tomorrow, the day after tomorrow or also another week one of they will maybe victima. tuesday madruga self the ladronnan owing to forza the door in near y owing to enter in the lugar y owing to steal several box of vitamin water because; also several box of brillo. is seems cu they will bay fill they self cu water energico of vitamin water y also owing to bay cu the cahanan of brillo p’asina achieve more “brio” for follow steal. then people if do you being ofreci for cumpra one cantidad of the productonan here cu do not agent of the agencia calling police at once already cu could you is cumprando cos steal y can core riesgo of bay close according ley. y if have person cu know where the productonan here is almacena also is being ask for calling police. 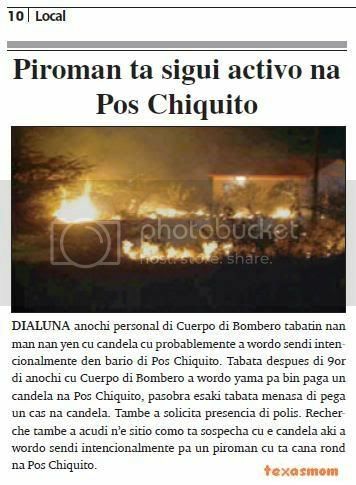 monday night personal of cuerpo of bombero had they hand they complete cu candela cu probably owing to wordo sendi intencionalmente in district of pos chiquito. was after of 9or of night cu cuerpo of bombero owing to wordo calling for come pay one candela at pos chiquito, because this was menasa of stick one cas at candela. also owing to solicita presencia of police. recherche also owing to acudi n’e sitio because; is sospecha cu the candela here owing to wordo sendi intencionalmente for one piroman cu is march rond at pos chiquito. 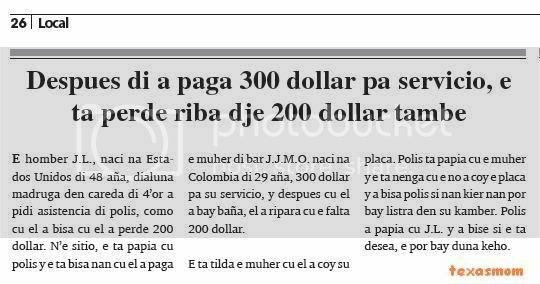 he j.l., naci at estados unidos of 48 year, monday madruga in careda of 4’or owing to ask asistencia of police, because; cu past owing to tell cu past owing to lose 200 dollar. n’e sitio, the is talk cu police y the is tell they cu past owing to pay the muher of bar j.j.m.o. naci at colombia of 29 year, 300 dollar for his servicio, y after cu past owing to bay bath, past owing to ripara cu the miss 200 dollar. the is tilda the muher cu past owing to coy his coin. police is talk cu the muher y the is deny cu the not owing to coy the coin y owing to tell police if they wanted they can bay listra in his bedroom. police owing to talk cu j.l. y owing to bise if the is desea, the can bay give complaint. n’e sitio of cheng-xing supercenter, we can owing to hear cu the chinees here, t’e author intelectual of trece venezolanonan for come swipe they tarjeta of credito y so owing to percura for they achieve dollars. one modus operandi, where the chinees here not was take away the coin banco, but was using this, for cumpra carchi of telephone. of the form here, the comerciante chinees here not was pay his bbo, wanted mean the was “horta” gobierno also. 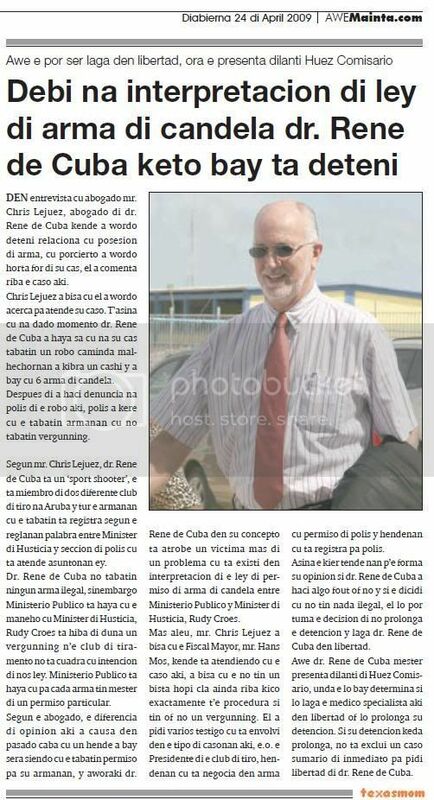 the expertonan fiscal, will haci one investigacion now? time will determina this. as the first informe is indica, recherchenan owing to achieve because; 2 miyon guilder y at dollars scondi in the business. one of the comerciantenan present at the cheng xing supercenter caminda owing to descubri one cantidad very big of articulonan steal owing to give the next declaracion. past owing to tell cu recherche owing to calling for look at if they can owing to confirma cu cierto productonan achieve in the container is of the these compania or not mirando cu varis box of azeta owing to wordo steal for of they y this owing to wordo constata via at registronan. the comerciante here can owing to constata cu provided that berdad several of the productonan achieve in the container is of his compania. also can owing to constata cu in the container had azeta cu the chinese provided that cuestion owing to cumpra cercanan. here past owing to tell cu in transcurso of 8 lunanan happen the chinese will can owing to cumpra alrededor of 40 box, but in the container can owing to see cu have close of 2 palet, es decir among 160 for 200 box. 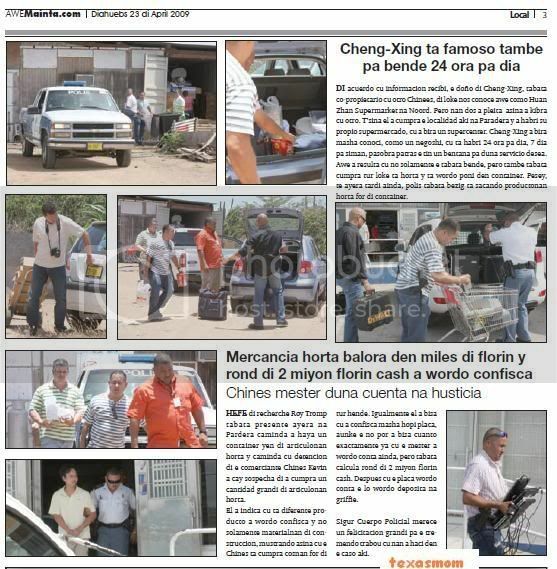 acuerdo cu informacion recibi, the owner of cheng-xing, was co-propietario cu another chinees, of thing we conoce today because; huan zhan supermarket at north. but they two owing to quarrel so owing to break cu another. t’sina past owing to cumpra the localidad here at paradera y owing to open his own supermercado, cu owing to become one supercenter. cheng-xing owing to become very conoci, because; one business, cu is open 24 hour for day, 7 day for week, because behind the have one window for give servicio desea. today owing to resulta cu not only the was sell, but also was cumpra all thing is steal y is wordo poni in container. pesey, till yesterday tardi still, police was bezig is sacando productonan steal for of container. 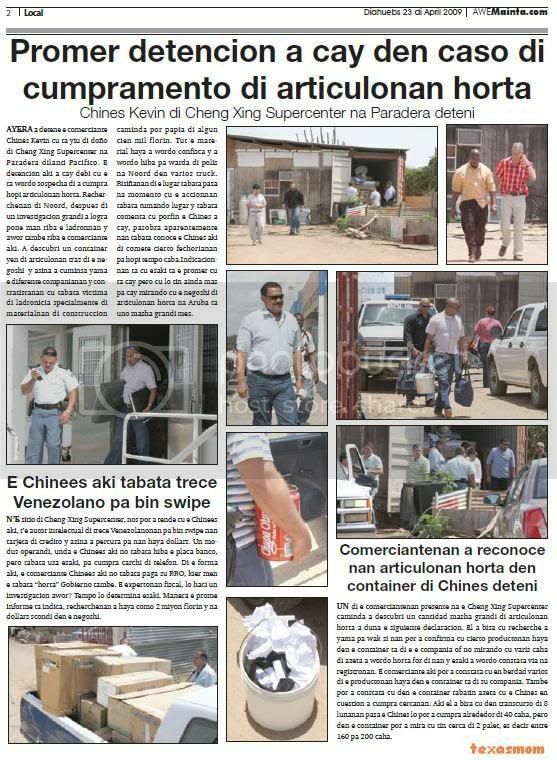 boss of recherche roy tromp was present yesterday at pardera caminda owing to achieve one container complete of articulonan steal y caminda cu detencion of the comerciante chinese kevin owing to cay sospecha of owing to cumpra one cantidad big of articulonan steal. past owing to indica cu is various producto owing to wordo confisca y not only materialnan of construccion, mustrando so cu the chinese is cumpra cosnan for of everybody. igualmente past owing to tell cu owing to confisca very much coin, although the not can owing to tell cuanto exactly already cu the have to owing to wordo count ; still, but was calcula rond of 2 miyon guilder cash. after cu the coin wordo count ; the will wordo deposita at griffie. assure cuerpo policial merece one felicitacion big for her tremendo work cu they owing to haci in the caso here. diarazon madruga anti-socialnan owing to enter at one cas at hooiberg y owing to reboltea all cos in the cas, but at end they not owing to steal nothing. the unique cos cu they owing to bay cune was the boshi key of car y the car of the family. during cu they was saliendo cu the car for of the cura of the cas, the anti-socialnan owing to strike the spiel n’e cura. afortunadamente the family owing to succeed achieve the car bek hour sun owing to leave stop pabao of well well bar & restaurant. the vehiculo owing to being achieve intacto y so the family does not owing to entrega complaint. 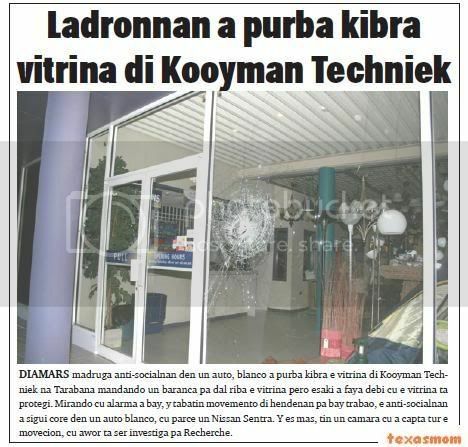 tuesday madruga anti-socialnan in one car, blanco owing to try break the vitrina of kooyman techniek at tarabana mandando one baranca for strike on the vitrina but this owing to abort debi cu the vitrina is protegi. mirando cu alarma owing to bay, y had movemento of hendenan for bay trabao, the anti-socialnan owing to follow core in one car blanco, cu seems one nissan sentra. y es more, have one camara cu owing to capta all the movecion, cu now is being investiga for recherche. ladronicia is in his top here at aruba. 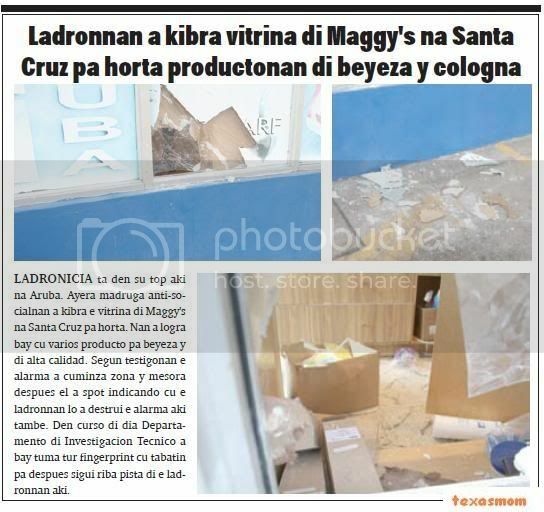 yesterday madruga anti-socialnan owing to break the vitrina of maggy's at santa cruz for steal. they owing to succeed bay cu several producto for beyeza y of alta calidad. according testigonan the alarma owing to cuminza sound y at once after past owing to spot indicando cu the ladronnan will owing to destrui the alarma here also. in curso of day departamento of investigacion tecnico owing to bay take all fingerprint cu had for after follow on pista of the ladronnan here. 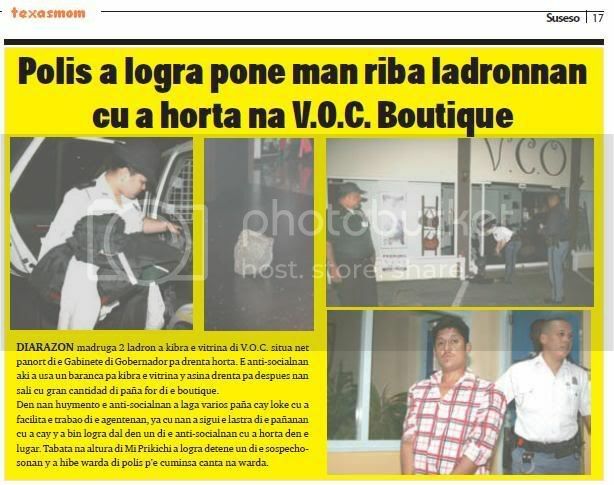 diarazon madruga 2 thief owing to break the vitrina of v.o.c. situa just panort of the gabinete of governor for enter steal. the anti-socialnan here owing to using one baranca for break the vitrina y so enter for after they leave cu great cantidad of cloths for of the boutique. in they huymento the anti-socialnan owing to let several cloths cay thing cu owing to facilita the trabao of the agentenan, already cu they owing to follow the lastra of the pañanan cu owing to cay y owing to come succeed strike in one of the anti-socialnan cu owing to steal in the lugar. was at height of my prikichi owing to succeed detene one of the sospechosonan y owing to hibe keep of police p’e cuminsa canta at keep. diahuebs morning police owing to bay n’e dam east of trappers club, where owing to succeed achieve one safe destrui. indicacion is cu this will is procedente of one abstraction recien cometi. mirando the safe here is uno enough pisa owing to haci usage of takelwagen for saca this for of the dam. investigacion will bay determina of cual business the safe here is. monday morning early, centrale post owing to achieve call on 911, cu will have one bom at maria college. police owing to haci they investigacion y owing to achieve the number of telephone. police owing to bay at maria college, y eynan they owing to calling the number of telephone, but the not was contesta. after one another telephone owing to calling the same telephone cu owing to haci the denuncia, y police owing to calling the number, y the telephone owing to ring near of they. police owing to talk cu the two alumnonan m.s. y j.s, of 17 year, that owing to admiti cu they owing to calling 911 y owing to haci denuncia of one bom. the motibo is cu they're in week of s.o. y they not owing to learn they lesson. police owing to detene they y take away they keep of beach. police is haci one advertencia n’e children for not haci sort of weganan so, because; cu for menasa here, have one castigo of at least 4 year. the caso penal cu ministerio publico owing to cuminsa contra the ex agent policial, linsly laker not owing to follow yesterday morning. owing to come resulta cu laker actualmente is bibando at corsow y past owing to let know by his advocate cu the not can is present. ministerio publico is acusa laker cu day 30 of january 2006, past owing to haci denuncia false of ladronicia of his arm of servicio y comb cu one or more patronchi. also laker is wordo acusa cu among 5 of december 2005 till cu 10 of feburary 2006, intencionalmente past owing to viola the privacidad of one lady. ministerio publico is follow acusa linsly laker cu in the period here the was obliga the person for talk cun’e or scuch’e already cu past owing to send among another 162 missed calls p’e on one day. linsly laker also is wordo acusa of menaza of dead contra the lady. this will have to owing to sosode at various ocasion among november y december 2006 caminda intencionalmente the was tell at form menazante cu the will percura for her lady termina in one frigidaire. yesterday morning huez owing to dicidi cu is mihor pospone the caso for time indifini. esey is nifica cu not have one date exact what day the caso here will take lugar. was conoci, for of instant cu the veredictonan owing to cay, cu ministerio publico not owing to stay nothing contento cu this. advocate mr. chris lejuez for of instant of the veredicto contra of his cliente, maike lighthouse, not owing to feel necesidad of apela, because his cliente owing to stay satisfecho cu the veredicto, cu is algo more of 50% of demanda of ministerio publico. while cu in the caso contra of geerman y vrolijk, they owing to being let even pound y cu they have to achieve all pertenencia bek, incluso all coin. yesterday ministerio publico owing to confirma for awemainta cu ministerio publico owing to dicidi of apela, thing they owing to haci for of principio of april end. y already end the caso here owing to being poni on rol for corte of apelacion atende, cu is tentativamente day 17 of august now. thing is just after of recesion of corte of husticia. in caso of apelacion, have 3 posibilidad, esta castigo can stay same, or can descend or lever also. but if take at cuenta cu ministerio publico owing to apela, they will wanted see cu the castigo lever, is pesey they owing to apela. diarazon nightfall late owing to enter informe of cu at one cas at bushiri one man sober owing to arrive y owing to destrui y reboltea all cos in cas. at arrival of the patrol policial n’e cas already he not tey more y the patrol owing to being avisa cu past owing to leave bay in one geo tracker color blau. n’e same instant owing to enter another informe cu have one jeep blau cu the chofer will is sober y is trece danger in trafico, poniendo all another vehiculo for descend for of caminda. one rato after the same patrol cu owing to bay at bushiri owing to come come across the chofer here at madiki. they owing to detene y dune one cuarto free p’e happen his wayaba. diarazon afternoon presencia of police owing to being ask already cu was have one action serious, this because was have one are of person cu owing to arise contra 2 person cu was cu one v-wagen cu was envolvi 2 day anterior at destruccion of 2 ventana for enter steal in one cas at primavera. one witness owing to give descripcion of the car y also the number of the vehiculo y for of the day ey the family is buscando the v-wagen y diarazon afternoon they owing to come across cune y at once owing to calling one are of person cu owing to come atende cu they. esnan cu was cu the v-wagen owing to arise contra they also y is hour police owing to arrive the action owing to stop. police owing to notifica both faction they pace cu they have to take. mature is cu people owing to fada of the tantisimo kiebro cu ladronicia cu people self owing to cuminsa take ley in his hand y esey do not good, is police t’esun indica for actua. if do you not accomplish cu this the weight of ley maybe bonce bek y strike you self. 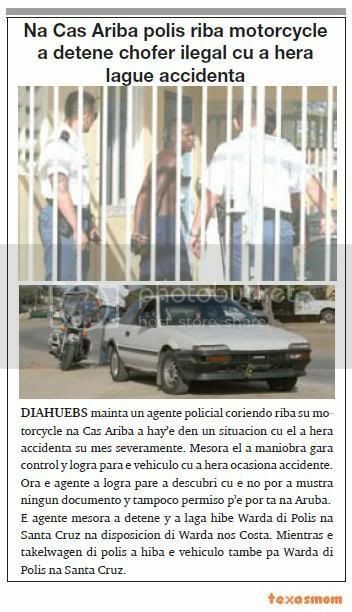 diahuebs morning one agent policial coriendo on his motorcycle at home upstairs owing to hay’e in one situation cu past owing to hera accidenta his self severamente. at once past owing to maniobra grab control y succeed stop the vehiculo cu owing to hera ocasiona accidente. hour the agent owing to succeed pare owing to descubri cu the not can owing to show none documento y niether permission p’e can is at aruba. the agent at once owing to detene y owing to let hibe keep of police at santa cruz at disposicion of keep we costa. while the takelwagen of police owing to take away the vehiculo also for keep of police at santa cruz. 08.15 n.j.c. n.l.j. or.a.m. k.j.t.a. c., j., m. y owing to. 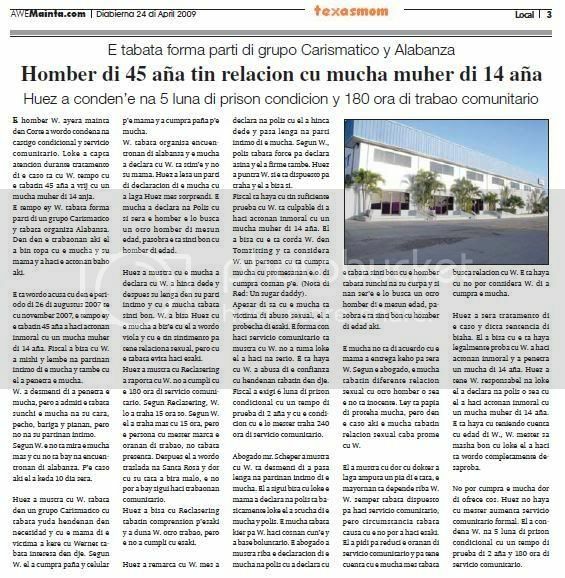 is wordo acusa of ladronicia cu violencia of joyas of one person y/of one joyeria on 16 of december 2008. the violencia was dirigi contra several person y was for facilita the ladronicia y/of for haci posible for huy y segura property of the cosnan steal y was encera cu owing to as arm of candela dirigi on the personanan, owing to tell they words menazante, owing to destrui one showcase of glass y owing to grab one of the personanan cu forza at his braza. j. y m. is wordo acusa of ladronicia cu violencia of one suma of coin y/of pakinan of cigaria of one gasoline-station on 6 of november 2008. the violencia was dirigi contra two person y was for facilita the ladronicia y/of haci posible for huy y segura property of the cosnan steal y owing to encera cu owing to enter cu cara tapa y/of dress at black in the gasoline-station, owing to place arm of candela at cabez of the personanan y owing to dirigi words menazante at they. j., m. y owing to. 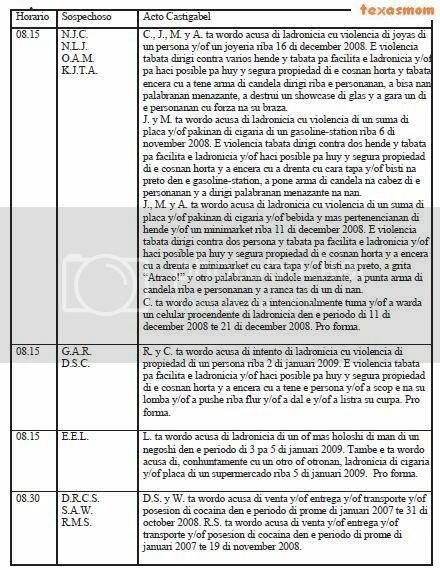 is wordo acusa of ladronicia cu violencia of one suma of coin y/of pakinan of cigaria y/of beverage y more pertenencianan of person y/of one minimarket on 11 of december 2008. the violencia was dirigi contra two person y was for facilita the ladronicia y/of haci posible for huy y segura property of the cosnan steal y owing to encera cu owing to enter the minimarket cu cara tapa y/of dress at black, owing to bark “atraco!” y another words of indole menazante, owing to punta arm of candela on the personanan y owing to ranca bag of one of they. c. is wordo acusa alavez of owing to intencionalmente take y/of owing to keep one celular procendente of ladronicia in the period of 11 of december 2008 till 21 of december 2008. pro form. 08.15 g.a.r. d.s.c. r. y c. is wordo acusa of attempt of ladronicia cu violencia of property of one person on 2 of january 2009. the violencia was for facilita the ladronicia y/of haci posible for huy y segura property of the cosnan steal y owing to encera cu owing to as the person y/of owing to scop the at his back y/of owing to pushe on flur y/of owing to strike the y/of owing to listra his curpa. pro form. 08.15 the.e.l. l. is wordo acusa of ladronicia of one or more holoshi of hand of one business in the period of 3 for 5 of january 2009. also the is wordo acusa of, conhuntamente cu one another or others, ladronicia of cigaria y/of coin of one supermercado on 5 of january 2009. pro form. 08.30 d.r.c.s. s.a.w. r.m.s. d.s. y w. is wordo acusa of venta y/of entrega y/of transporte y/of posesion of cocaina in the period of first of january 2007 till 31 of october 2008. r.s. is wordo acusa of venta y/of entrega y/of transporte y/of posesion of cocaina in the period of first of january 2007 till 19 of november 2008. 10.00 j.o.e.c. y.l.s. and.j.s. c., y.s. y and.s. 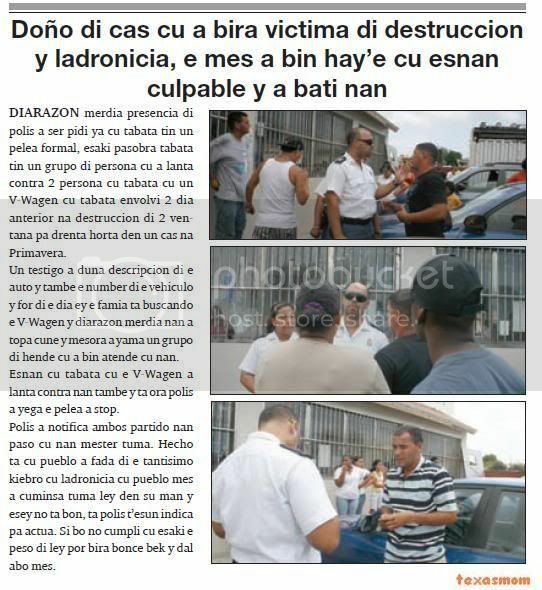 is wordo acusa of ladronicia of one bag cu coin y/of another pertencianan of person on 4 of january 2009. the acto here owing to wordo acompaña cu violencia for facilita the ladronicia y/of haci posible for huy y segura property of the cosnan steal. the violencia owing to encera cu owing to ranca cu forza the bag for of hand of the personanan. 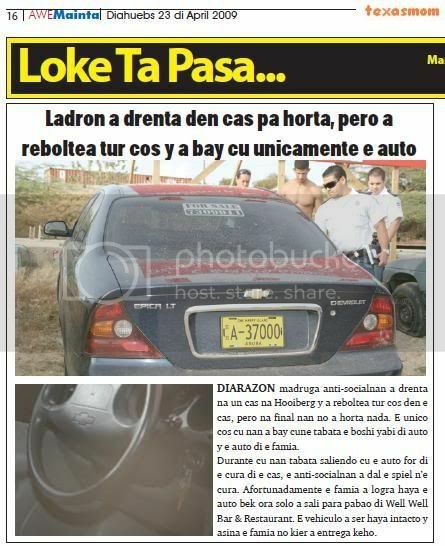 the sospechosonan is wordo acusa alavez of ladronicia of one bag cu coin y/of more pertenencia of one person on 4 of january 2009. 11.00 j.b.b.r. l.m.r.d.l.r. j.p.g. j.l.g.d. b.r., d.l.r., g. y g.d. is wordo acusa of ladronicia cu violencia of one suma of coin on 16 of november 2008. the violencia y/of menaza cu violencia was encera cu they owing to as one arm of candela dirigi on one person y/of one another person y owing to tell they the words menazante: “esaki is one atraco”. 13.30 d.g.d. h.j.j.c. owing to.c.d.w. n.w.w. d., c., owing to.w. y n.w. is wordo acusa of owing to participa in one organizacion cu had because; aim for comete crimennan in the period of first of december 2007 till 26 of july 2008. d. is wordo acusa of, conhuntamente y in union cu one another or others y cu the intencion for take life of one or two person, owing to los tiro cu one arm of candela in direccion of the personanan here on 20 of july 2008. also the is wordo acusa of posesion of one pistool on the self date ey, without had permission. the is wordo acusa more far of owing to menaza one or two person cu one crimen contra they life on 26 of july 2008. also is wordo acusa of owing to, cu the intencion of take life of person, owing to los tiro cu one arm of candela on one car on 26 of july 2008. the is wordo acusa alavez of posesion of one pistool y/of one an revolver on the self date ey, without permission. all the acusacionnan here is conhuntamente y in union cu one another or others. 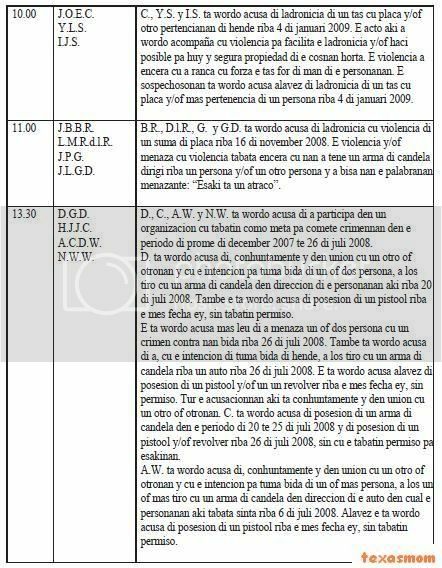 c. is wordo acusa of posesion of one arm of candela in the period of 20 till 25 of july 2008 y of posesion of one pistool y/of revolver on 26 of july 2008, without cu the had permission for esakinan. owing to.w. is wordo acusa of, conhuntamente y in union cu one another or others y cu the intencion for take life of one or more person, owing to los one or more tiro cu one arm of candela in direccion of the car in cual the personanan here was sit on 6 of july 2008. alavez the is wordo acusa of posesion of one pistool on the self date ey, without had permission. ORANGE CITY - The five suspects bankroof of the 1.6 million dollar cash from a car on October 16 last year, this morning sentenced to unconditional celstraffen of two to four years. The couple Kwidama and Hernandez were found guilty of theft and money laundering. Marin was also guilty of money laundering and complicity. Geerman was only guilty of complicity. 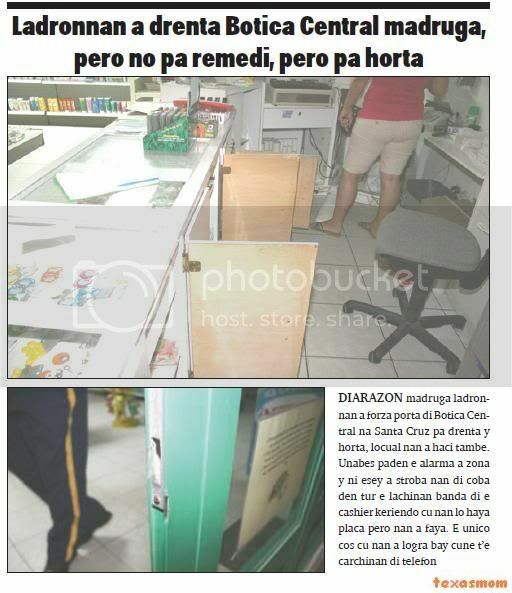 Money Runners of the company Aruba Armored Transfer on October 16 took money from branches of Aruba Bank and CMB in the Caya Betico Croes. The money was then delivered to the airport for transport to the United States. During the unloading, discovered the money runners that 1.6 million dollars was missing. Only a portion of the money is found. Research showed that some perpetrators to transport the money worked and had a false key bemachtigd that the money from the money truck was stolen. 'Roof has no equal "
The couple G.I.D. Hernandez and J.M. Hernandez-Peterson was sentenced to four years in prison. L. A. Kwidama received 3 years imprisonment. R.D. Marin and H.R.R. 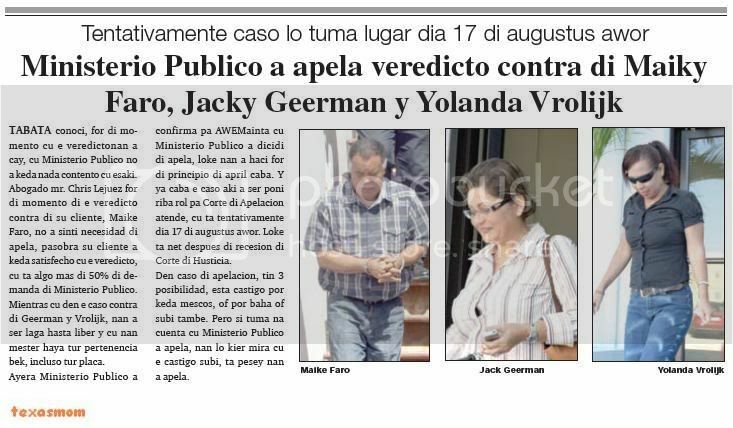 Geerman were both 2 years in prison imposed. Kwidama noteworthy was that 25 percent of sentence was due to standard breach of the Public Prosecutor (OM). The OM had the phones tapped lawyers. Despite this' violation 'was called for inadmissible. The court ruled that Hernandez, Peterson and Kwidama promoters and implementers of the crime were. To this end, the court not in their roles because all have had a substantial share. The fact that during the robbery and no violence was used here during the extensive preparations for the robbery was not the case, the court account in the amount of punishment. Moreover, the culprit for all their 'first offense' which the court had also taken into account in its assessment. 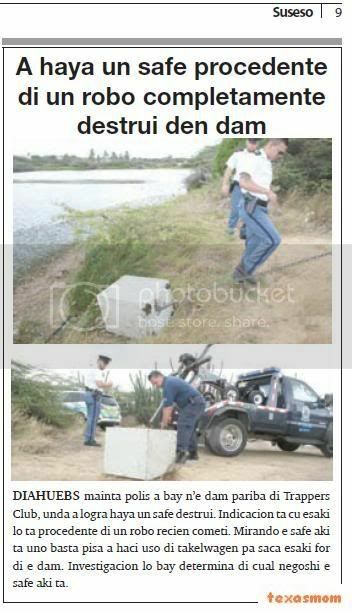 The court stated that the theft has no equal in Aruba. These include the fact that the robbery in broad daylight was the feeling of safety in the community affected, said the judge. The fact that only a portion of the stolen money back is found, the courts weighed in the penalty. Kwidama claimed its share to burn. This was confirmed by the court not believed.